Beachy waves are a very sought after look for so many females out there. I personally LOVE the look and am obsessed with tousled, effortless-looking hair. In an effort to listen to my amazing hair dresser for once in my life, I have gone on a hunt for products that do not have any drying ingredients, like alcohol. What I found out was that it is SO HARD! I was on the prowl for some sea salt spray, other than the Bumble and Bumble Surf Spray (which is actually amazing), and I could not find one that did not contain alcohol! To be fair, I did not look in salons, just in drugstore’s (yes, I know drugstore hair products are not the greatest, but it’s also not going to break the bank), but I digress. I came up with the brilliant idea to make my own sea salt spray! It was not difficult, but it was definitely not just water and salt for ingredients, which is what I thought (yeah, sometimes I’m not the sharpest tool in the box). I made this spray and tried it out and my mind was blown. I thought I would never be able to make any spray product that worked as well as the Bumble and Bumble Surf Spray, but I did it! I want to try so many more variations of the recipe to see if I could make it even better (clearly, I did not have high expectations and was very impressed with myself)! I have made this spray and used it quite a few times and I have been very pleasantly surprised. My natural hair is out of control. I’m talking lion mane with some kind of make-shift waves. It used to be quite nicely wavy until I decided to go blonder, so now if it air dries with no product, it’s just a mess. I used the spray and my hair went from an untamed, frizzy mess to tousled, beachy waves. There was still a tiny bit of frizz but I feel like I was getting away with it. Put all the ingredients into a bowl and mix in the boiling water until the rest of the ingredients have dissolved. Let cool, pour into a spray bottle, and voila! Your own sea salt spray, it’s that simple! You can also put the ingredients into a spray bottle and shake it to dissolve everything with the boiling water, however, I do not recommend doing this with thin plastic as it may very well melt. To use it, just spray into damp, towel dried hair and let air dry or use a diffuser. I usually let mine air dry but I scrunch it with my hands and blow dry the roots slightly on low. I encourage you to try this spray and let me know how it worked for out for you by leaving a comment below! Subscribe the blog to get email notifications for new posts, follow my Instagram for photos and updates, IGTV for new videos, and coming soon …YouTube vlogs! There will come a time in every woman’s life where she drops her compact pressed powder on the floor. Next comes the immediate rush of fear and hoping and praying that what you most fear happened, has happened. As you open that compact, squinting in fear, you realize the worst has happened. It’s broken. 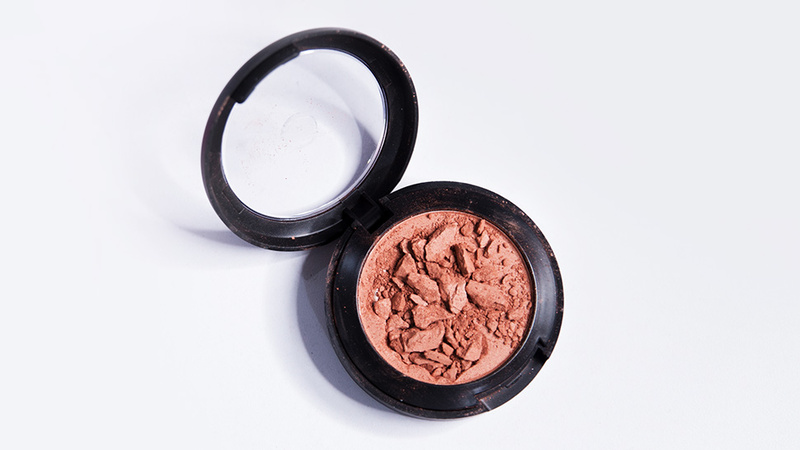 What was once a perfectly pressed blush or bronzer or powder has smashed into pieces. Why, God, whyy??? You yell as you throw your hands in the air and fall to your knees. No? Only me? OK, well regardless, it is not a pleasant feeling. I am here to tell you that there is hope! There is a solution to your woes, and that solution is not carefully opening the broken compact and lightly tap on the product with your brush every time you want to use it again. You can actually fix the issue by pressing that bad boy back into place! It is not going to be rocket science, but I am going to share some tips and tricks with you that I use if I ever don’t pay attention to life and drop a compact. First, what you are going to want to do is carefully open the broken compact. Do it slowly so that it doesn’t all come flying out and you get a cloud of powder in your face and up your nose. Next, make sure your hands are clean and place the powder compact on a flat surface. Grab a clean press powder sponge (do not use a pressed powder puff) or if you do not have a sponge to use, you can wrap a tissue around your finger to use. Press gently into the powder until the cracks mould back together and then lightly dust the top of the powder with a brush to ensure it is pressed in enough that it will not crack again. Another way to do this (if the above doesn’t work) is to break up the rest of the pieces in the compact so that they are all finely broken. Then take a piece of saran wrap and place it over the powder (tissue works too but saran wrap is better). Start to press down on the product until it begins to become one solid piece again. These steps work great with ‘wet’ powders like shimmer products or foundation powders. If you are using a pressed powder that is a little on the drier side, I would recommend using a drop or two of rubbing alcohol or a lightweight face oil. If using one of these fixes, please be careful to only use one or two drops and add more drops if needed as it may damage the product and make it harder to use. Leave a comment below if you have any other tricks you use! Don’t forget to subscribe to the blog and follow along on Instagram! The hot weather has been pretty consistent with the sun and heat, which means it is now crucial to protect your skin against the sun. But, sunscreen that goes on your body is not usually good for your face. My general rule of thumb is put a higher SPF on my face, because I burn a lot easier on the face than the rest of my body. For day-to-day I use an SPF 30, and I use lower SPF in the winter and fall (yes, you still need to protect your skin when there is no sun out and when it is not summer because, hello, UV rays). My skin can be pretty sensitive on my face, so I like to use products that are not super heavy, and that don’t leave that white residue after applying. It is also good to use a sunscreen that is specifically for your face (duh) an not a general, all over product because it can clog pores and cause breakouts. Because I live in Vancouver, I can get away with wearing an SPF 30 at most on my face and be OK. However, if I am on vacation somewhere that tends to be a lot hotter (like Vegas, or that one time I went to Hawaii), I will up the SPF to anywhere between 45-60. Hawaiian Tropic BB Cream SPF 30 is pretty much my go-to. I ‘ll be honest, I started using sunscreen every day as my moisturizer because I am using a Retinol acne cream, which can cause the sun to affect your skin more. I found this one a little while ago in Shoppers Drug Mart when I was looking for a face sunscreen and I thought, why not try this one out. I was hooked immediately. It has a light tint to it and smells amazing (because I am obsessed with the smell of sunscreen). As far as inexpensive products go, this one is my favourite facial sunscreen. 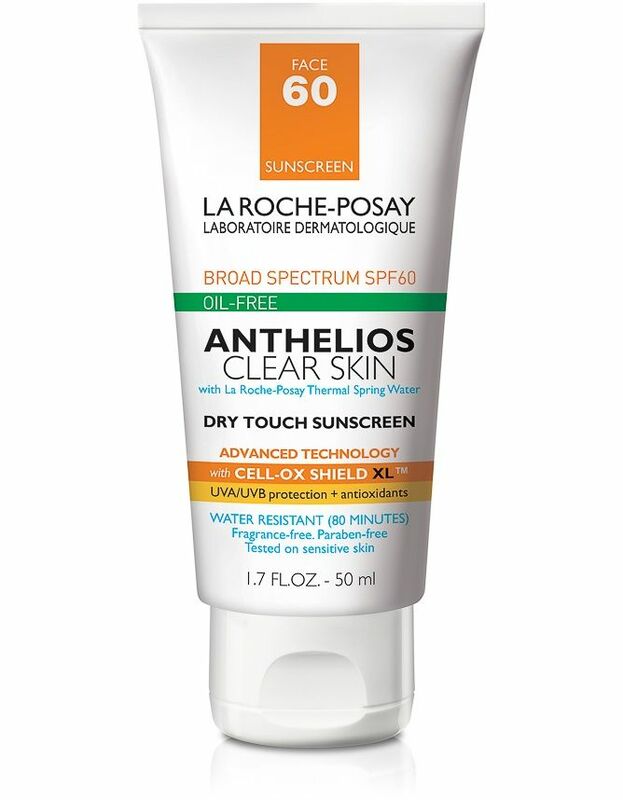 La Roche-Posay has got to be one of my all-time favourite skincare brands. It is perfect for sensitive skin, gentle, and has such a wide range of products for every skin type. I have used a few of their facial sunscreens and absolutely love them! They are a bit more pricey but perfect if you are going on vacation somewhere where the sun is more powerful. The product is lightweight, and feels great on the skin. It is also perfect for wearing under makeup because it is not so heavy. 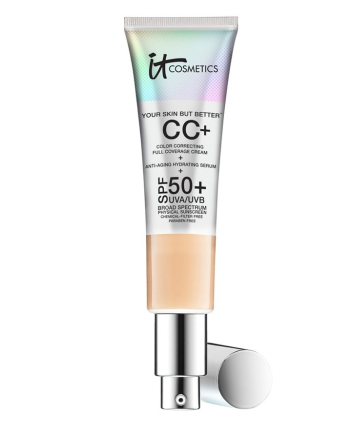 I just tried this CC+ Cream from itCosmetics a couple of months ago for the first time ever and I have to say, I am hooked! This is perfect for summer! Lightweight (yeah, I know right?! ), easy to apply, and best of all it is full coverage! I was shocked when the girl at Sephora told me it was full coverage. I was sceptical until I tried it for myself and I was very impressed at how much a little of this product you need to use. I highly recommend this product to anyone who is looking for something that feels lightweight but also provides more coverage than a BB or regular CC cream. 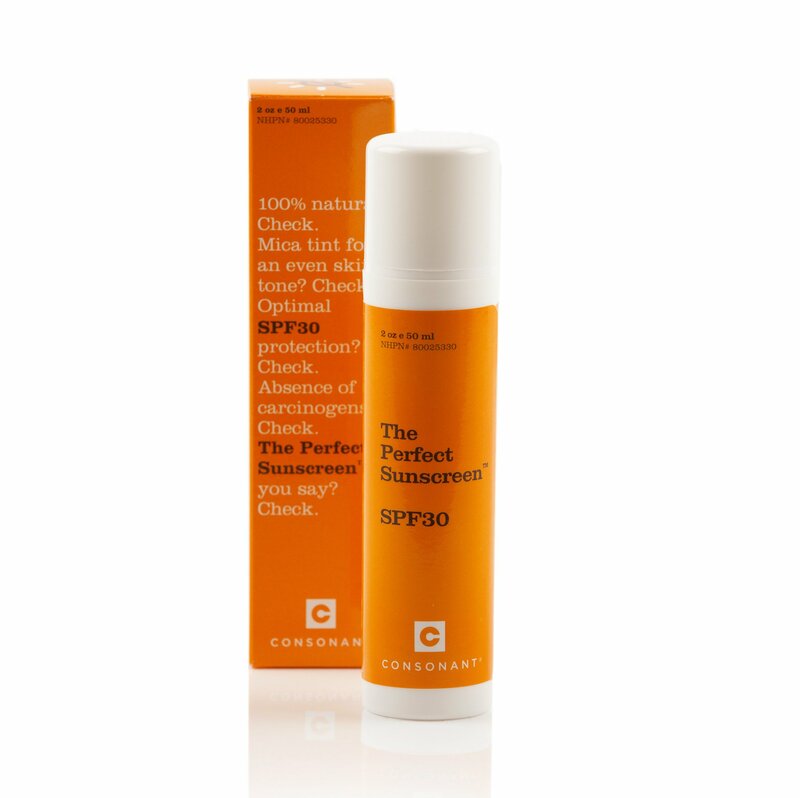 The Perfect Sunscreen by Consonant is pretty amazing. I tried this product out at an event and thought it was great! This sunscreen is 100% natural, non-greasy, and leaves no white residue. This product is also water-resistant, however they do recommend re-applying after swimming or playing water sports. It is a great product to use as a daily moisturizer or under your makeup. Sun-care is always super important for summertime, but don’t forget that the sun shines all year round and we are exposed to UV rays even when the sun is hidden behind those pesky rain clouds. It is beneficial to wear SPF on your face to protect your skin all year round, but especially in the summertime when the sun is at its most damaging. Even if you are like me and want that bronzed skin so you go to the beach covered in tanning oil, always make sure your face is protected. When I slather tanning oil on myself, I always make sure I have sunscreen on underneath and that I have a higher SPF on my face. Let me know what products you like and maybe I will give them a try! I am always on the lookout for new brands and items to try out! Leave a comment below and follow the blog for weekly post updates! Have you ever been invited to a wedding and get super excited, but then also start to panic because you don’t know what you will wear? This is the story of my life with every event I get invited to or host. I get excited for the event, then I panic because in typical girl fashion I have ‘nothing to wear’. I am the type of person who struggles with the concept of wearing a nice dress to more than one event. I have been told “why don’t you wear that dress you wore to the other wedding?” Um, hello?! Maybe because I have already worn it? Duh! I am not going to wear the same gown to two weddings where the same people are in attendance. Some people think this is ridiculous and tell me to get over it (those people being my mother and grandmother), but I have issues so they have learnt over the years to deal with it. The most recent wedding I had been to was this past Saturday to celebrate two friends. The groom I met through the bride although we went to the same high school, and the bride I have known since we were in kindergarten. The wedding was beautiful, from the ceremony, to the decor, and of course her dress. I was at a wedding the week before and wore a long black dress with floral print on it. 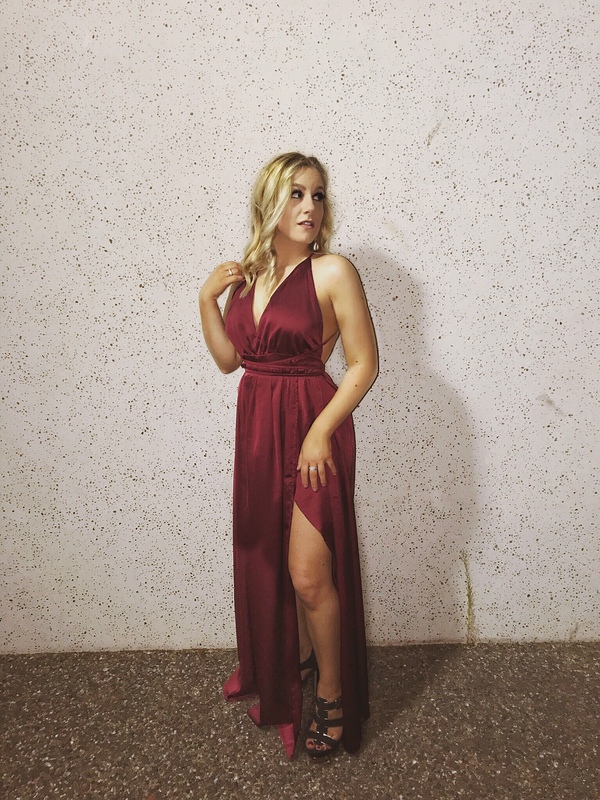 For this wedding, I opted for a long, backless red dress with a slit in the side. It was a hit and I got quite a few compliments on it. The day of the wedding came and even though I fell asleep on the couch at about 1:45am and woke up at 6:20am, only to shower off my self tanner and crawl into my actual bed to try and sleep another 2 hours, I felt great. I got ready and went to the church ceremony in a short, floral dress with black pumps (this, I unfortunately do not have photos of because sometimes I forget). After that I had approximately four hours to get my life on track, re-do my hair and makeup for the evening and get to my aunt and uncle’s house to steam my dress all before cocktail hour. Not surprisingly, we missed cocktail hour, thank you Vancouver traffic. The wedding was great, the food was amazing, and the dancing lasted all night. I wish I took more photos and videos, but alas, I usually don’t take too many when I’m having so much fun. Below are photos of the dress I purchased off of SheIn. This dress cost me about $20 CAD and fits me so well. I was more than pleasantly surprised when I received this dress. I paired it with a pair of ALDO shoes that I purchased a few years back. I did not alter the dress in any way, although I will meet to get it hemmed about an inch. When ordering online, please keep in mind to look at sizing charts and if the site shows it, what size the model is wearing. I usually do check both and try to be as realistic as possible about my size compared to the super fit, thin, tall model who is wearing the clothes. With the Asian sites like SheIn, there are a lot of items that fit smaller than usual, so what I do is check YouTube try on videos of the brands so that I can get a better feel for what the product is going to look like when I get it (I’ve said it before and I will say it again, don’t expect designer quality at the super low prices these websites offer). *** Follow the blog for weekly posts, Facebook and Instagram for photos and updates (@romeacristinaa), IGTV and coming soon … YouTube!